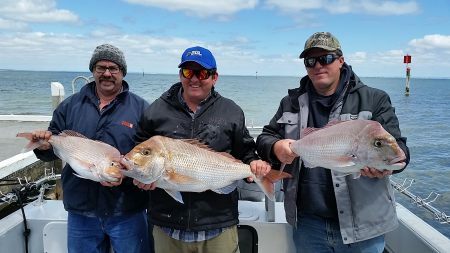 In Victoria Fishing Getaways offers the opportunity to fish Westernport and Port Phillip Bay as well as Bass Strait all reachable from Melbourne within an hour. Each destination has a prime season for certain species and we are kept abreast by our operators as to what is biting in the area each week during the peak seasons. Within Victoria’s salt water categories you can expect to catch are species such as Snapper (Oct-Mar), Whiting (Nov-Jun), Elephant Fish (Feb-Apr) and Sharks (Year Round). Our Victorian operators have all been fishing their respective waters for a number of years and we recommend them based on the professionalism of their operations including qualities such as skilled skippers/deckhands, quality of gear, cleanliness and general likeability. Within our Victorian range we offer share charters in all locations and sole boat bookings with trips ranging from 4 hours to full days on the water. Perfect for social gatherings, family fishing, school groups, corporate events or just a couple of mates wanting a day on the water without the hassle of launching your own boat. We also run special 4 hour trips in the school holidays we call our Kids Fishing Trips designed especially for the young angler. 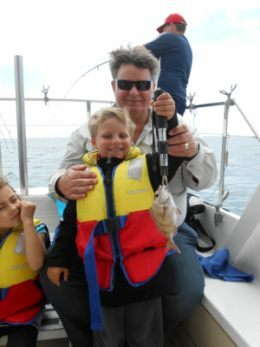 Our boat is very safe for young children, the crew love teaching young anglers and all tackle is provided plus a sausage sizzle and we have some special activities and fun trophies and the end of the trip. Departing from Mornington Pier, this vessel is a sturdy and reliable craft which is perfect for the kid’s first time on the water or a corporate function for up to 20 people. 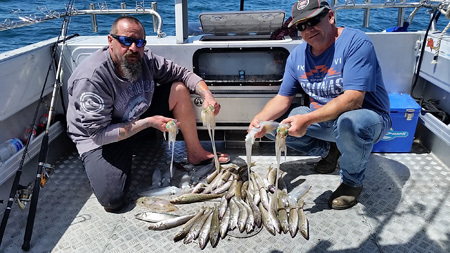 Mornington offers the chance to catch a range of species in the warmer months from Snapper to Whiting, Flathead and Gummy Sharks. All fish are bagged for easy transport to your kitchen at the conclusion of the trip. We have shared kids trips available on School holidays. 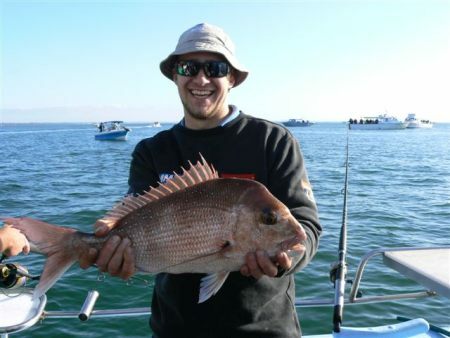 Located in St Kilda, Melbourne, we’re the ultimate offshore fishing charter business around. 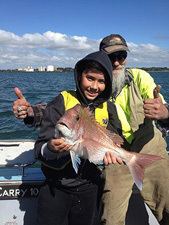 With over 25 years’ experience, our family owned fishing charter business operates throughout Port Phillip Bay, Westernport, Portland and Port Fairy. Our staff’s unique and experienced knowledge of the waters, gives you the best chance, by putting you on the best spots, to catch the greatest fish… all while having fun! 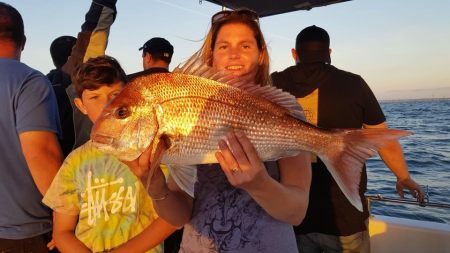 Group bookings consist of a maximum of 10 for snapper trips, and will provide endless fun out on the bay. Our experienced team is dedicated to your group's enjoyment, teaching everyone the ins and outs of fishing, for the ultimate fishing experience. Our top of the range fishing tackle and gear is at your disposal throughout your fishing tour of the bay. All trips include fishing gear, bait and water/soft drinks, with toilet facilities on board. Our guided fishing trips are open 7 days a week, including public holidays. Email us to check availability & cost. Note: the above trips may depart from different locations, due to season. Departing from Queenscliff at the heads of Port Philip Bay provides access to some excellent fishing grounds for snapper, whiting and squid within the bay along with fishing outside for mako sharks and kingfish. This boat provides the preferred platform for catching Whiting and Snapper. While it may not be the fastest in the fleet, your expert skipper will put you onto the right spots. Included with this vessel is all quality Shimano and Penn gear and instead of the traditional charter boat BBQ, they will provide you with a lunch of tasty roast beef and lamb rolls for something different.